American Ginseng, similar to Chinese Ginseng except that it has a milder effect, contains ginsenosides, which are thought to fight fatigue and stress by supporting the adrenal glands and the use of oxygen by exercising muscles. American Ginseng tonifies the five organs: the liver, heart, lungs, kidney, and spleen. For centuries Ginseng has been regarded as the most valuable herb in the Asian world. Its power to improve one’s well-being is legendary. 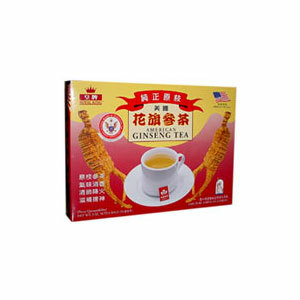 The Ginseng used to make Royal King American Ginseng Tea is carefully selected from the most highly prized Ginseng in the world. Many visitors from the Orient bring our top quality Ginseng home to friends in China. It is a most welcomed gift. 100% pure top grade American Ginseng (Panax Quinquefolius) from Wisconsin, USA. American Ginseng, similar to Chinese Ginseng except that it has a milder effect, contains ginsenosides, which are thought to fight fatigue and stress by supporting the adrenal glands and the use of oxygen by exercising muscles. American Ginseng tonifies the five organs: the liver, heart, lungs, kidney, and spleen. It also says that it is effective for neurasthenia, it strengthens the immune system, clears up the eyesight, vitalizes the mental faculties, and alleviates chronic fatigue and that continuous ginseng use thus leads to health and longevity. American Ginseng nourishes the yin while benefiting the Qi. To make tea, add boiling water over 1 tea bag in a cup or more for teapot. Stir well and cover for 3 minutes. Honey may be added to flavor the taste. Each bag can be re-brewed several times.